Las Casuelas Terraza marks its 40th anniversary but probably not with the snow that fell in 1979. 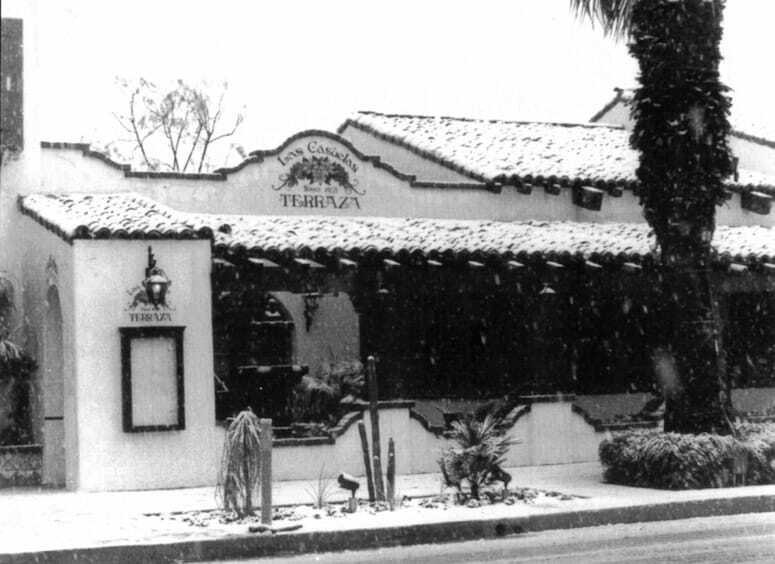 Fourty years ago when Las Casuelas Terraza opened, Palm Springs experienced a historic snowfall. This is a photo of the restaurant on opening day, Feb. 5, 1979, surrounded by snow. On Feb. 5 – the same day the restaurant opened its doors four decades ago – Las Casuelas Terraza in downtown Palm Springs will donate 40 percent of sales to four local charities that are close to the Delgado family’s hearts. Boys and Girls Club of Palm Springs, AAP Food Samaritans, the Palm Springs Police Officers’ Association and Well in the Desert will be the beneficiaries. The public is welcome to join the Delgado families for a toast and a few words of appreciation in the palapa bar from 5-6 p.m. that day. Guests will also enjoy live music during both lunch and dinner by PS Sound Company and Hot Roxx. The restaurant’s recipes date back to the 1920s when Florencio Delgado’s mother, Maria Farjardo, fed copper miners in Arizona who came to her kitchen door to purchase delicious meals she prepared in her earthenware pots and pans. Florencio (Del) with his wife, Mary, brought his mother’s authentic Mexican recipes to Palm Springs in 1958. They opened the original Las Casuelas nearly 60 years ago. In addition to the family’s classic recipes handed down four generations, the restaurant is known for its more than 18 varieties of margaritas, as well as over 100 of the finest sipping tequilas. Guests have a number of choices in the type of Las Casuelas Terraza experience they want to enjoy – the cantina, small intimate dining rooms, or outside on the patio surrounded by towering palms trees. The restaurant also features live bands and dancing. For more information, visit lascasuelas.com or call 760-325-2794.